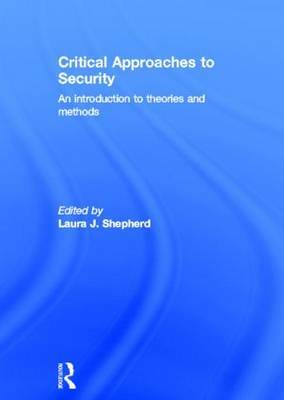 Focusing on critical approaches to security, this new textbook offers readers both an overview of the key theoretical perspectives and a variety of methodological techniques. With a careful explication of core concepts in each chapter and an introduction that traces the development of critical approaches to security, this textbook will encourage all those who engage with it to develop a curiosity about the study and practices of security politics. Challenging the assumptions of conventional theories and approaches, unsettling that which was previously taken for granted - these are among the ways in which such a curiosity works. Through its attention to the fact that, and the ways in which, security matters in global politics, this work will both pioneer new ways of studying security and acknowledge the noteworthy scholarship without which it could not have been thought. This textbook will be essential reading to advanced undergraduate and postgraduate students of critical security studies, and highly recommended to students of traditional security studies, International Relations and Politics.